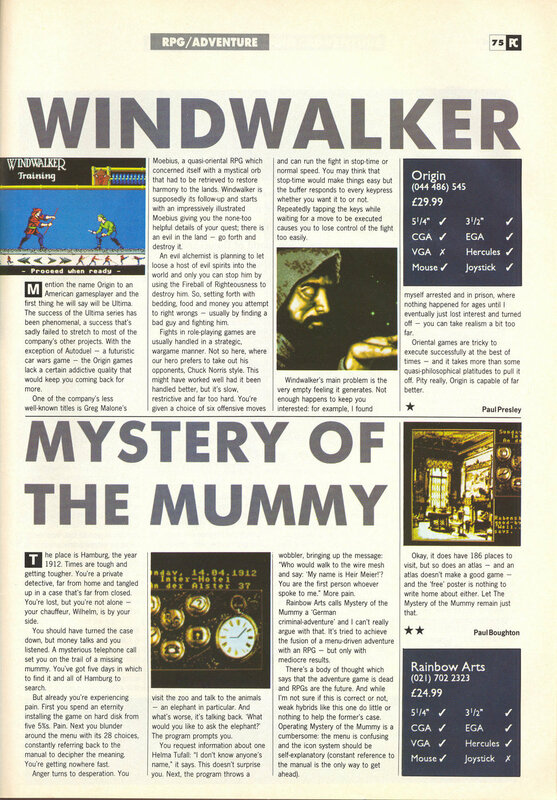 This is a short review of Windwalker from Issue 1 of PC Leisure magazine (Spring 1990). This was the first UK magazine entirely devoted to non productive uses of PC’s, although that didn’t mean just games and it was only quarterly. The review is harsh giving the lowest possible score, although I can’t remember liking the game too much myself. Moebius wasn’t entirely awful but it really didn’t deserve a sequel. This entry was posted in Magazine Scans, Windwalker by Pix. Bookmark the permalink. The image isn’t showing up? Sorry to be that guy. Great site though, really. I check here semi-frequently to read up on what’s new. Thanks for letting me know. Part of the link was missing, it worked ok in IE but caused an error in anything else. Well at least I wasn’t just being an idiot over here haha. Thanks a lot.